air joe is proud to serve the Fox Valley community! We are proud to be a part of this community, serving your heating and air conditioning needs: air joe is listed in many directories under titles such as : Fox Valley Heating Contractors, Fox Valley Heating, Fox Valley Air Conditioning, Heating Repair, Air Conditioning Repair, Fox Valley Heating and Cooling Contractors, Rooftop HVAC Repair, Ductless AC Systems, Boiler Repair and Fox Valley Heating and Air Conditioning Contractors. We are here for you whether you need furnace or air conditioner repairs, heating and cooling estimates, equipment replacement or new installation of a furnace, air conditioner, heat pump, rooftop heating and cooling or comfort products to improve the air filtration for your home or business. About Fox Valley, IL - Happy to be your hometown Heating & Air Conditioning Contractor! The Fox Valley is a Northern Illinois region situated around the Fox River. The area extends from the southern city of Ottawa all the way to the northern village of Antioch. Located along the western side of the Chicago Metro area, the Fox Valley includes 19th-century downtown areas, suburban developments, and even rural communities, and a total of about 1 million people call the region home. 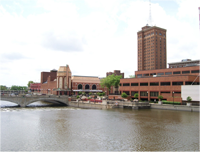 Aurora, Illinois is the largest city in the Fox Valley, and it is the second largest city in the state by population. With nearly 200,000 residents, this city is situated predominantly within Kane County. Aurora is seated on the outskirts of the Illinois Technology and Research Corridor, which brings a variety of career opportunities to the area. Some of the largest employers are Caterpillar and the Rush-Copley Medical Center, and students can prepare for their future careers at Aurora University, Waubonsee Community College, and Rasmussen College. Aurora is home to a variety of entertainment opportunities for visitors and guests. The downtown area features the Paramount Theater, the Hollywood Casino, and Leland Tower, which is the tallest building in the state outside of Chicago. There are several educational sites and museums within the city limits, including the Phillips Park Zoo, the SciTech Interactive Science Museum, and the Aurora Regional Fire Museum. Other cultural sites can also be found in Aurora, including the Hindu Sri Venkateswara Swami Temple of Greater Chicago. The Fox Valley lies within a humid continental climate zone, meaning that each of the four seasons are unique with varied weather conditions. Summers can be quite warm to hot, and humidity levels are high. When temperatures reach the 90s, residents rely on their air conditioning systems to stay comfortable and safe from heat-related illnesses. Spring and autumn are quite comfortable and mild, but dangerous weather can occur again in the winter, when freezing temperatures and snow storms are common. During these months, a reliable home heating system is essential.